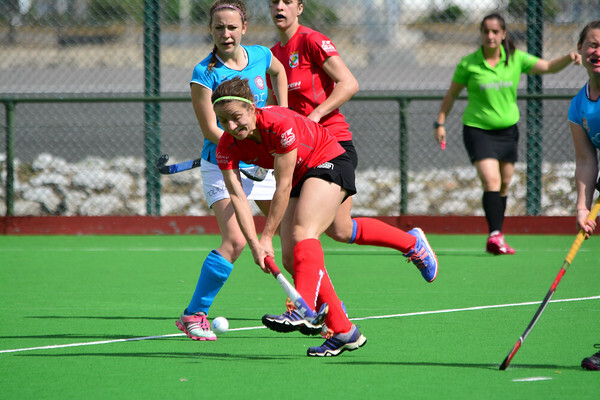 NAVAX set EuroHockey off with a win. A lot of shouting ensured the start of the match was to be real. Most of it coming from the pitch as people arrived. Halfway through the first half pupils from Bayside Comprehensive arrived to watch the start of EuroHockey where Austrian team NAVAX played Croatian team Mladost. The pupils were then joined by players from other teams taking part in the tournament hosted on Gibraltar. Simple sensible game by the NAVAX kitted out in sky blue was seen in the few minutes. A solid defence by NAVAX and deliberate slowing of pace working on precision short passing game brought them the first goal with 23mins to go of the first half. NAVAX had a couple more chances before halftime with Mladost finding it difficult to reach the oppositions goal. Towards final minutes Mladost pressed for equaliser trying reach NAVAX d. They were caught out on a break and conceded a short corner. NAVAX went 2-0 ahead with just two minutes of first half to go. NAVAX started the second half attacking from the off set. Mladost started to take the game back to them but we’re getting caught out with quick breaks and forced to run back to cover their defence. Mladost were hard pressed with NAVAX having more of the play due to their strength as a unit, as opposed to Mladost greater reliance on their main players to take them forward. Mladost first real chance came from their number 4 with a quarter of an hour to go. The ball just grazing past the post. NAVAX had most of the chances towards the end as they sought for the third. The match ended with NAVAX winning 2-0. The next match sees local team Eagles playing.